Spaceport America is situated 140km north of El Paso in Sierra County, New Mexico. Image courtesy of URS / Foster + Partners. Entrance gate of Spaceport America, the world's first commercial spaceport. 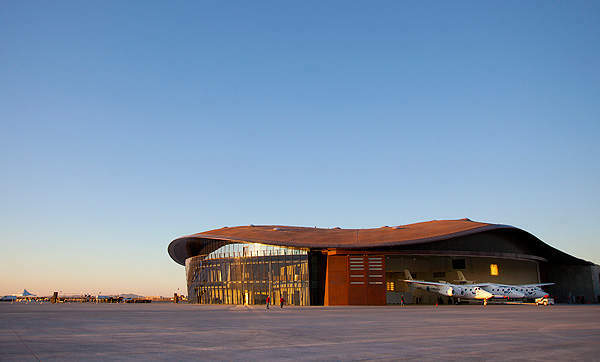 The terminal hangar facility at Spaceport America was dedicated for Virgin Galactic in October 2011. Image courtesy of Virgin Galactic. Aerial view of Spaceport America. Image courtesy of Virgin Galactic. 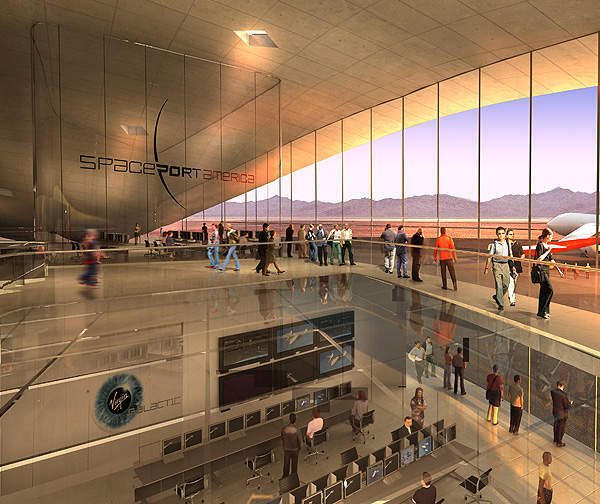 Conceptual image of the lobby at Spaceport America. Image courtesy of URS / Foster + Partners. Spaceport America (earlier known as Southwest Regional Spaceport) is the first commercial spaceport in the world. It is situated 140km north of El Paso in the Sierra County of New Mexico. The facility is owned and operated by the New Mexico Space Authority (NMSA). Tenant units present at Spaceport America include UP Aerospace, Virgin Galactic, Moog-FTS, Microgravity Enterprises, Armadillo Aerospace and Celestis. Eight suborbital launches had been launched successfully from the port by October 2009. Construction of a spaceport in New Mexico was first advocated by Dr. Burton Lee of Stanford University in 1990. The Southwest Space Task Force was set up in 1992 to enhance the commercial infrastructure and activities of the New Mexico Space Industry. NMSA signed an agreement with Virgin Galactic in 2005 to build Spaceport America in the state of New Mexico. In 2006, Virgin Galactic announced its plan to locate its headquarters in spaceport and operate spaceflights from there. The master plan of the Spaceport America includes the construction of a runway, internal roadways, a water supply and distribution system, wastewater collection and treatment systems, aircraft rescue, a fire fighting station, fuel storage facility and a terminal hangar facility (THF). 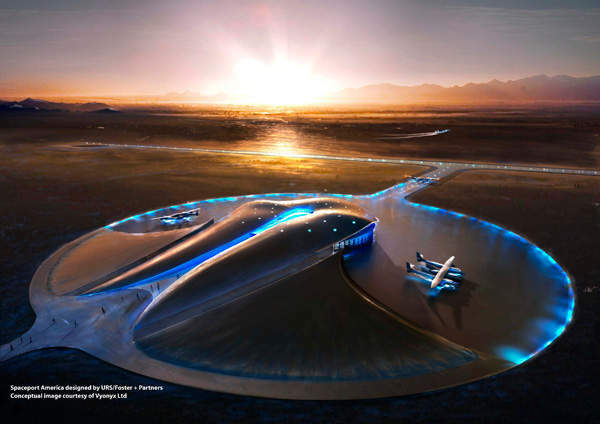 Virgin Galactic and NMSA will deploy their administrative facilities in the western zone of Spaceport America. The central zone will boast a 47,000 square feet double-height hangar. The eastern zone will be earmarked for operational training, departure lounges, spacesuit dressing rooms and on-site restaurants. The terminal of the THF will train astronauts and their pilots before their voyages in to space. The hangar oversees all pre and post flight servicing of the aircraft. 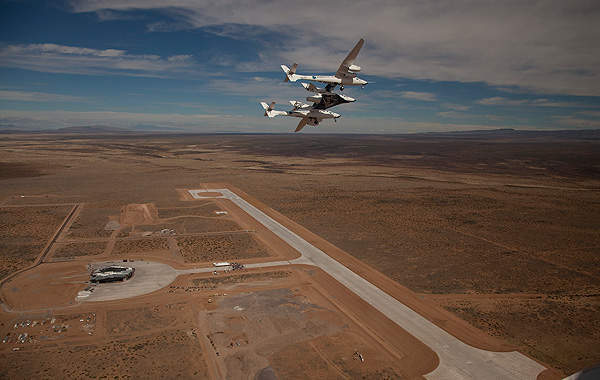 Virgin Galactic signed a 20-year lease agreement with NMSA to utilise the 110,152 square feet terminal hangar facility of the spaceport for parking two White Knight Two carrier aircraft and five Spaceship Two air launch vehicles. 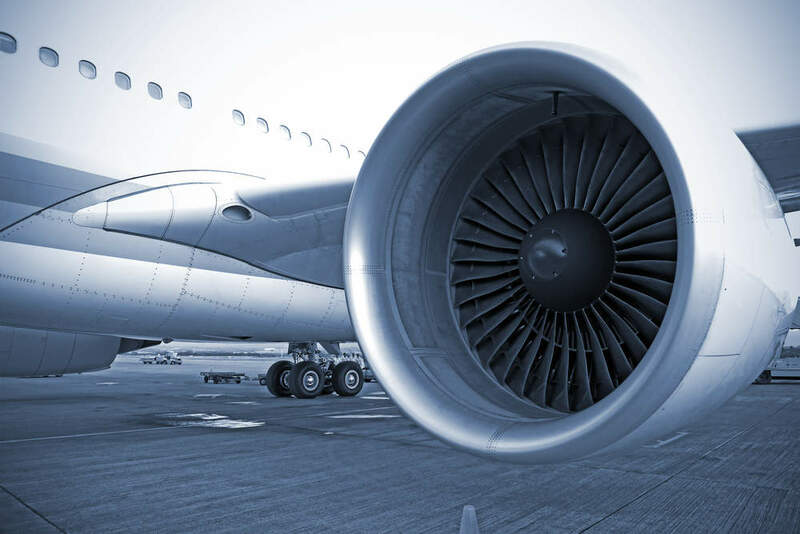 The company agreed to pay $1m a year for the first five years, followed by a graded-pay scale thereafter, depending on the number of launches which will be carried out. The joint venture of Foster + Partners, SMPC Architects and URS Corporation designed the Spaceport America, adhering to LEED Gold certification requirements. It is a sinuous shaped three-storey building which allows visitors and astronauts to enter through a deep channel cut into the landscape. 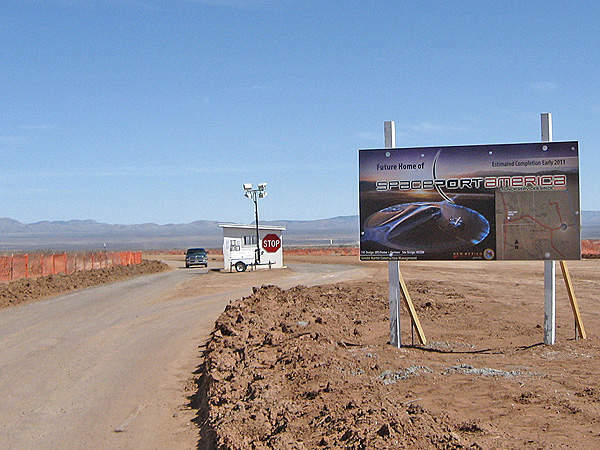 Construction of a maiden temporary launch installation at Spaceport America’s site was commenced in April 2006. UP Aerospace has launched multiple spacecraft from the installation. David Montoya Construction built a runway at Spaceport America from August 2009 to October 2010. Construction of the THF was completed in October 2011. Construction of the permanent launch facility began in June 2009, with an estimated capital cost of $209m. The facility is being built on a 670,000 square foot site in two phases. The first phase is expected to be completed in 2012 and the second phase following in 2013. Spaceport America will feature earth tubes for controlling the temperature. It will be equipped with a glycol solar collector array panels for space heating and domestic hot water. The facility will furnished with low water use fixtures, an adiabatic aided cooling system and modern energy control systems. The skylight, a glazed façade fitted to the terminal, will allow natural light to enter the building. Spaceport America has a single runway. The runway measures 3,048m long and 60m wide. In March 2012, the NMSA unveiled its plan to extend the runway by an additional 609m at a cost of $7m. The extension will be completed by November 2012. NMSA awarded a contract to Foster + Partners and URS Corporation in September 2007 to design and build Spaceport America’s permanent launch facility. HDR is providing the construction management services. Gerald Martin Construction Management of Albuquerque was selected as the construction manager, on behalf of NMSA in December 2008. In March 2012, NMSA awarded three separate contracts to Fiore Industries, White Sands Research and Developers (WSRD) and Parametrix for different works, related to the Spaceport’s infrastructure and operation.